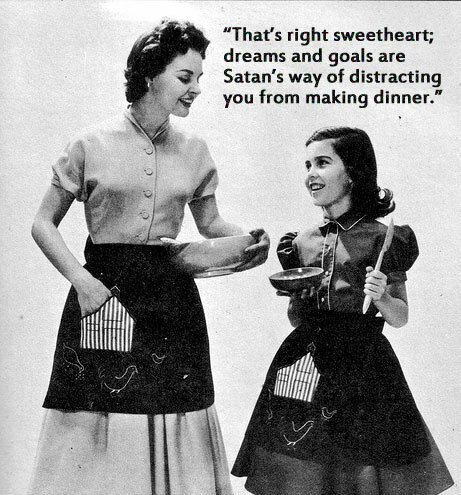 That\’s right sweetheart;dreams and goals are Satan\’s way of distracting you from making dinner. Yes, so that we can readily identify the womenfolk. Being as Gods? Knowledge of good and evil? Yes yes, and next time Satan distracts you, you’ll get the back of my hand twice as hard! Well of course. It is for her own good. We as Men need to beat the Satan out of the womenfolk. If not they will turn into witches and lesbians. You can`t even know how much I love this pic.